When you're hot... you're hot - Stop staring and start sewing! 2 blog posts in one evening!! That's got to be a record for me. The other one is over here at our Twelve by Twelve blog (which was previously updated in December!). Our group is full of very busy women...kids, jobs, homes....so it's a little tricky for everyone to juggle another project. Those gals all have terrific blogs though so be sure to check them all out (listed in the sidebar over there). Here's my stack of fabric that I'm going to divide up and send out this week. I'm almost 2 months behind (so hopefully they'll take me seriously when I say "no hurry, really")! 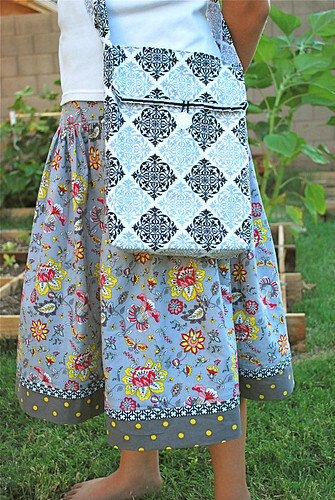 I've included some fabrics by Jennifer Paganelli, Heather Bailey, and Urban Chiks. Everything looked kind of fun and circus-ish to me. I think it will be fun when they all start rolling in (our Flickr group is here if you want to see what we've done so far). 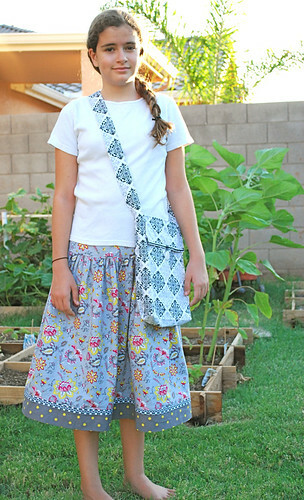 My sweet Sofia (the youngest of my 3 girls) asked for a new tote this weekend and I took the opportunity to talk her into a matching skirt. She's a bit of a tomboy so it's not always easy to get her to dress up. But she loved this Summer Soiree fabric so much I just ran with it. I used McCall's 4783 but changed the bottom part of the skirt to be gathered instead of "loose fitting" (I'm not sure how to describe it...a-line? flared?). It's out of print but I think I found a similar pattern in Butterick 4686. Anyhoo... here it is and as you can see smiling is a difficult task for a 12 year old. Seriously, would it kill you? I had to settle for a smirk. Here's a close up of the tote (which she loves best). I just used a hair elastic stitched in the flap to pull over the button. It worked great! Oh! Run over to Tanya Whelan's blog and look at the sneak peeks of her up-coming line!! I think it will surprise you! Yes, I'll get it all for the store but I'm playing with those orange prints first!! Have a wonderful week! 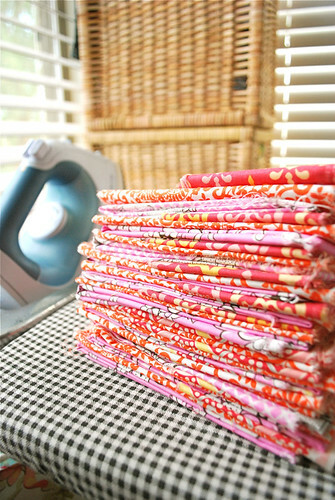 Get some sewing done (that's what I'm planning)!